I am such a fussy eater and although I have gotten much better at expanding my taste horizons I still like to examine menus of potential restaurants before I arrive there just to make sure there is something on it that I know I will like. This mixed with the fact my French is very minimal, meaning I can read and understand a couple of words, made my decision-making twice as difficult. I tended to stick with the typical foods you can get in most western restaurants. I know French food is supposed to be incredible but me and my fussy eating habits just won’t allow me to try it. Also being that I was on a two month trip I had to be very careful with how I was spending my money because I could easily spend my daily allocated euros on food! Because of this I had to look carefully at the menu prices before I choose somewhere to eat. I also have a habit of choosing the cheapest item that is available as well which is helpful when you are watching your money. This restaurant was literally right across from my hostel so was super convenient for me. It was a small but cute place. Inside they had a big pizza oven which added to the rustic feel. I got a mozzarella pizza and a Diet Coke, they also brought over a bottle of cold water to the table for free. The pizza was actually quite delicious. The vibe in the restaurant was quite chilled with people chatting quietly with their friends. For €12:80 I thought this was a good price and was affordable for the budget I am on. This place was an American 50’s style diner. They had the blue booth seats and the neon signs to give it that 50’s feel. This place was only a short walk away from where I was staying. They menu had typical American style food. I chose chicken tenders, fries and a coke. The chicken tenders where really nice, they weren’t just plain, tenders the batter had a little seasoning and I really enjoyed them. The fries where equally as good and I was so full I couldn’t finish everything even though I wanted too! I went quite early around 6 so it was quiet in the restaurant but as I was leaving more people where heading in. €10:30 was not a bad price for the amount of food I got, so I was happy with that. This was a restaurant near the metro that I took to get to the Eiffel Tower. I stopped in here before heading back to my hostel after a long day exploring the area around the Eiffel Tower. 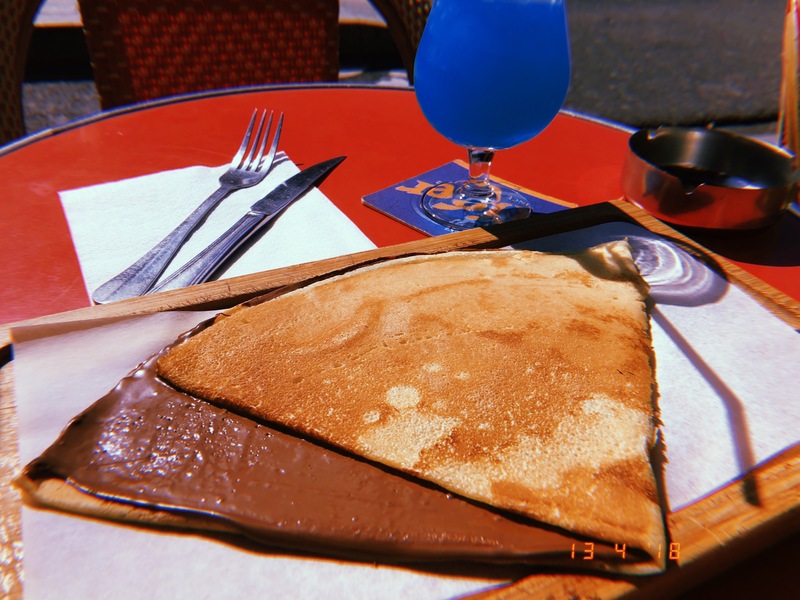 I got a huge Nutella crepe which was only €5 and a blue lagoon cocktail which was a bit more pricey at €10. The crepe was incredible and left me craving crepes for the rest of my time in Paris. The cocktail on the other hand was so bitter I was unable to drink it. The strong alcohol mixed with the citron juice was too much. It made my eyes water when I tried to sip it. I love blue lagoon cocktails so I was disappointed to leave it plus it was €10! I went here with a new friend and we where heading to the Tour Montparnasse to see Pairs by night (which is very beautiful!) and we didn’t have a restaurant in mind and just kind of looked at the menus outside different places. We eventually just decided on here. I ordered a cheeseburger and Malibu and coke but there was a bit of a language barrier because our waitress didn’t speak much English and my French is even worse. So when my drink arrived I just had coke, the waitress did come back and say they didn’t have Malibu left, of course I didn’t mind. When I ordered the cheeseburger I asked for it well done but I don’t think she was sure what I meant, so when it arrived it was rare. I plucked up the courage to ask for it not red and she did bring it back much less red. When I actually ate the burger it was actually really quite good! I guess I need to improve my french some more! Hard Rock is such a classic place. I’ve been to quite a few now. I do love the Hard Rock Cafe but it is quite expensive and so far has been the most expensive place I’ve been. The food is very good from here, I got a legend burger and a Malibu and coke. This order went much better than the night before. I don’t think I will be going back to anymore Hard Rock Cafe’s on this trip though because I just can’t afford to spend this kind of money regularly. 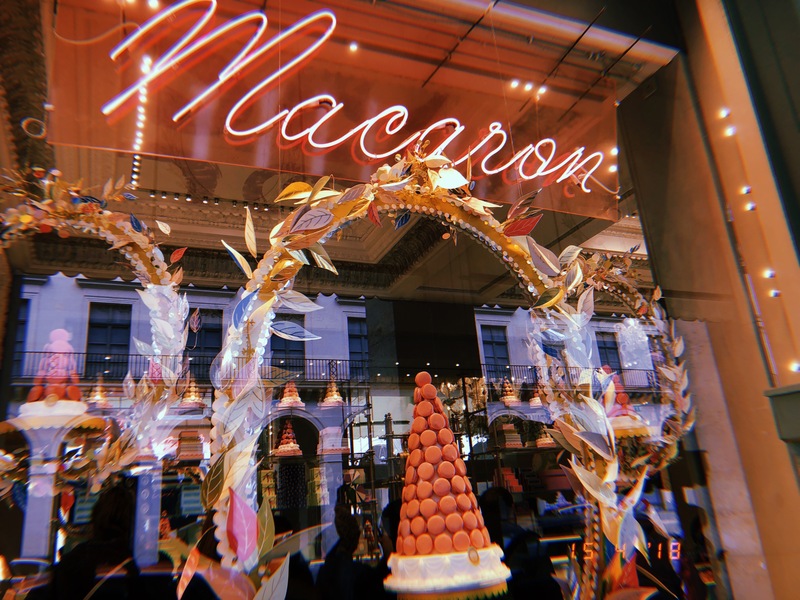 Okay so the amount I love the macaroons from Ladurée is unreal! 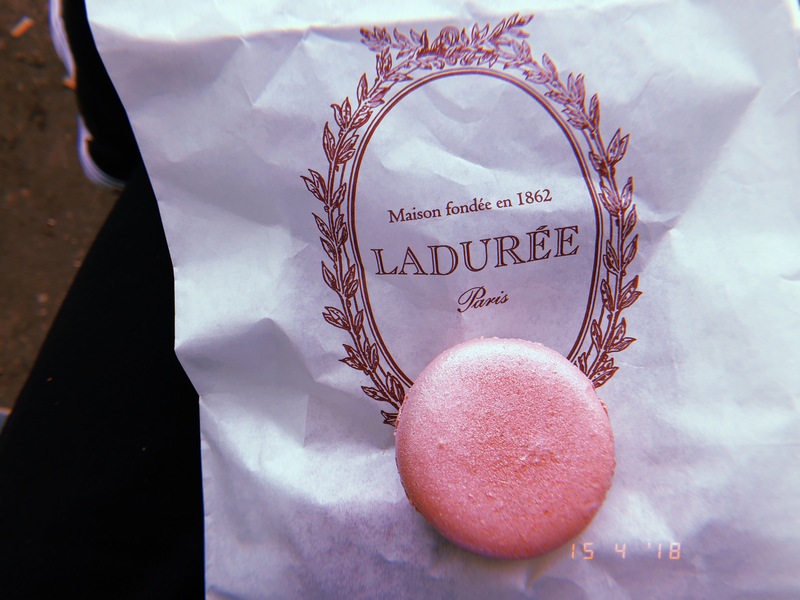 I had never had a macaroon before and now I think I’ve had the best ones that are available so no others are going to compare. I bought three regular sized macaroons for only €6:20 and I was expecting it to be at least €10. They had loads of different flavours to choose from it makes it really hard to pick some! I didn’t just come here once, I went out of my way to come back for more and you can only imagine my delight when I found a stand in the airport when I was heading to Madrid. Naturally I bought more even though it was 9am! I was just strolling about somewhere in Paris looking for somewhere to get a crepe because well why not? I was looking at different little restaurants and I couldn’t find anywhere that did them. I eventually stumbled across a little desert place which was super adorable. I obviously got a Nutella crepe again and they also gave me some free water for the table. There was so much Nutella on this crepe that it was dripping out as I was cutting it. The crepe its self was not too thin and not too thick, it was perfect! Plus it was only €4:50, perfect for a little snack after walking around all day. I also am a big fan of having picnics in the park partly because it’s cheaper than going to a restaurant. I found a supermarket called Franprix and I could get a decent lunch for less than €5 and that makes me very happy. Plus I often didn’t eat everything I bought so I even had snacks left for later on which is a bonus.